EDGE-5TM (Pre-workout Supplement) - ULTRA PREMIUM ENERGY & RECOVERY FORMULA NEW ENHANCED FORMULA: NOW WITH BCAAs, & BETA-ALANINE Get your five (5) energy boosting Amino Acids, BCAAs, Electrolytes, B-Vitamins, and Creatine all in ONE product and save your money! 1. BCAAs ✔️ 2. CREATINE ✔️ 3. GLUTAMINE ✔️ 4. B-VITAMINS ✔️ 5. ELECTROLYTES ✔️ You get 5 different products in ONE. The is why we call our flagship supplement, EDGE-5TM - The most complete and most effective Pre-workout supplement in sports nutrition. 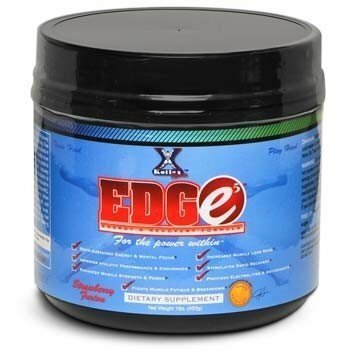 EDGE5 TM - The Pre-workout supplement, that helps you use your body fat as energy source during your workout. Try one today! NOW ON SALE!! Reg. Price $59.99. Sale Price $39.99 TYPICAL PRODUCT BENEFITS + Rapid Sustained Energy & Mental Focus + Improves Athletic Performance & Endurance + Enhances Muscle Strength & Power + Increases Muscle Lean Mass + Stimulates Rapid Muscle Recovery + Provides Electrolytes & Antioxidants + Fights Muscle Fatigue & Breakdown COMPETITIVE ADVANTAGE + This is the only product of its kind!! + Unique Amino Acid based Energy Drink that provides electrolyte replenishment + Generates sustained energy with no "Crushing or Jittery Effect" + The only Energy and Recovery product that helps you lose more body weight and fat!!! + Combines ingredients designed to give you instant energy and focus during physical activity + Excellent Pre-Contest/Pre-Workout formula; won't make you retain water + Contains Co-enzyme Q10, a powerful ingredient essential to energy production in the body + One of the Best tasting Sports/Energy Drinks + These statements have not been evaluated by the Food and Drug Administration. This product is not intended to diagnose, treat, cure, or prevent any disease. Competitive advantage based on label claim only. Individual results may vary. If you have any questions about this product by Koflex Sports Nutrition, contact us by completing and submitting the form below. If you are looking for a specif part number, please include it with your message.